I teased you on Facebook this morning by showing you a picture of boxes on my doorstep that arrived early this morning from So Delicious. I promised you a review and have been working on it feverishly all day (If you can call eating….er sampling products “work.”). Have I mentioned how much I love what I do? I felt like a kid on Christmas morning when the boxes arrived. These products haven’t even hit the stores yet, so I truly feel honored that So Delicious asked me to review them. Are you dying to know what these new products are??? I am sure the suspense is killing you. 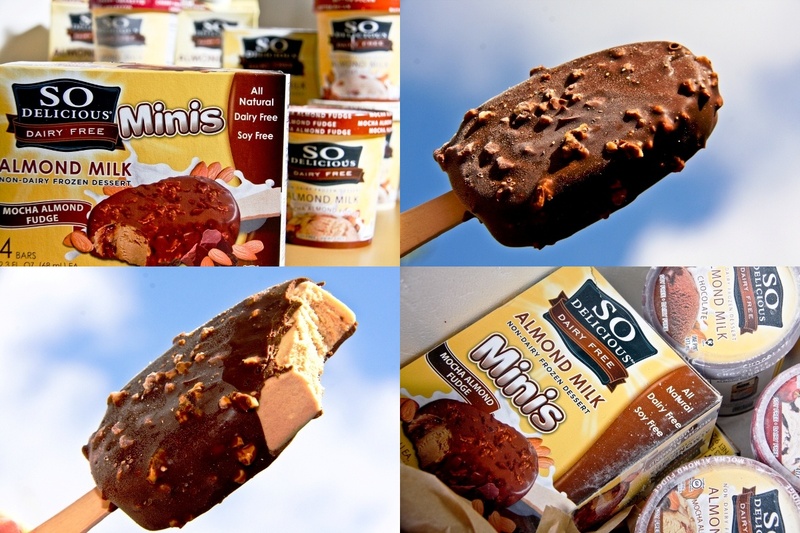 So Delicious has come out with a new line of non-dairy almond milk products! I am one of the most fervent supporters of Turtle Mountain’s So Delicious line. An outsider might assume that I am on their payroll, but I assure you I am not. So Delicious has provided my family with so much joy through their wonderful products and I will forever be grateful to them for that. I am also very appreciative of the fact that they are committed to providing products that are 100% plant based with no artificial sweeteners, trans-fats or hydrogenated oils. I have been an almond milk drinker for years and have liked what I bought well enough, but I have had complaints. I usually purchase lowfat unsweetened vanilla almond milk and it tends to be watery and lacking body (akin to fat free milk). 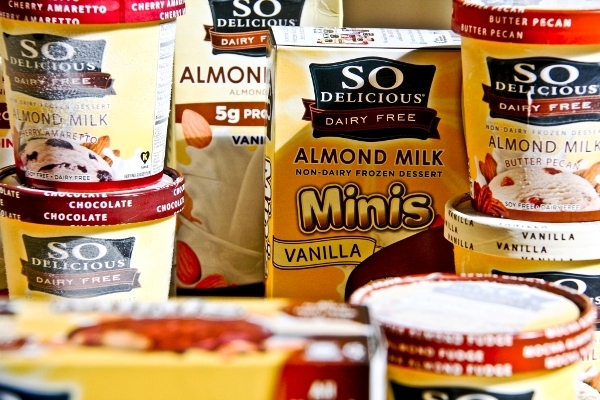 The new So Delicious line of almond milk is LOWER in fat, HIGHER in protein (5 times more!!! ), LOWER in sodium, and LOWER in sugar that my usual brand, AND has body. How do they do that? I swear they have magicians working in the R & D department. I tried both the Vanilla and the Original and was impressed by both. I am definitely switching to this brand of almond milk once I finish the boxes of my old brand that line my pantry. I am excited to try the Unsweetened variety for savory cooking applications. 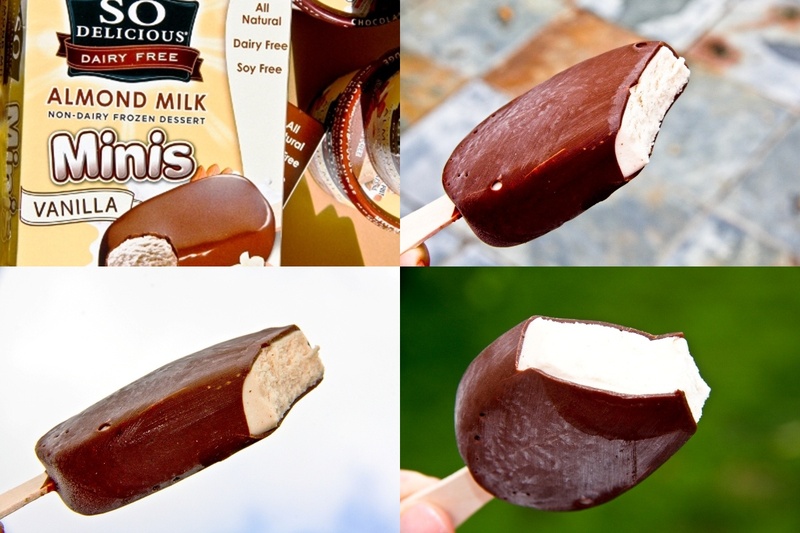 The Almond Novelties I tried were awesome. While I really liked both, I ended-up doing more than “sampling” the Chocolate Covered Vanilla Mini (I demolished the entire bar). I appreciate the fact that they make these desserts minis…otherwise I would probably end-up being maxi. All kidding aside, the bars are very reasonable dessert choices in that they range from 90-150 calories each. The ice cream sandwiches (which I didn’t try) have only 2.5 grams of fat a piece. Not bad at all! I will be the first to admit that almond milk ice creams are not usually my favorite because they tend to be a bit on the icy side and not at all creamy. Not so with these. I am not sure how they did it (that’s why they make the big bucks), but they managed to make creamy almond milk ice cream. I am usually a chocolate (with peanut butter OR mint) kinda gal, but I couldn’t get enough of their Butter Pecan almond milk ice cream. I tasted buttered pecans and brown sugar on every spoonful. At 160 calories and 7 grams of sugar per serving I am amazed that they were able to pack so much flavor into each bite. Divine. I was also pleasantly surprised by the Cherry Amaretto flavor which was so fresh tasting and loaded with cherries. The Chocolate was über creamy and the Mocha Almond Fudge had just the right amount of coffee flavor and was very generous with almond chunks, though I wish it was more generous with the fudge (but like I said, I am a chocolate kinda gal). Onto the real test of almond milk ice cream…vanilla. 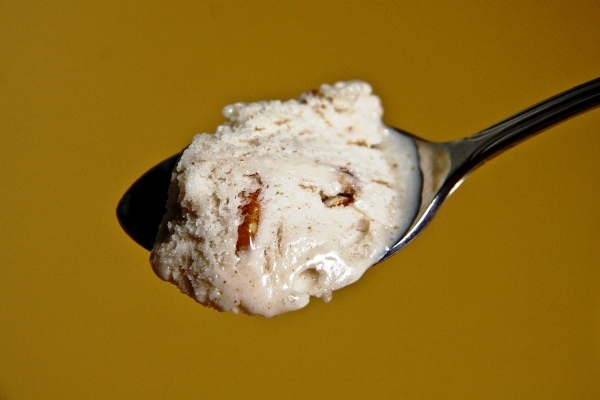 Their Vanilla was so light, delicate, and decadently creamy which is a huge feat for almond milk ice cream. All others that I have tried have failed in the vanilla department in my opinion since the taste of almond and iciness is usually so present. With So Delicious’s Vanilla all I tasted was a beautiful creamy vanilla. I am blown away. 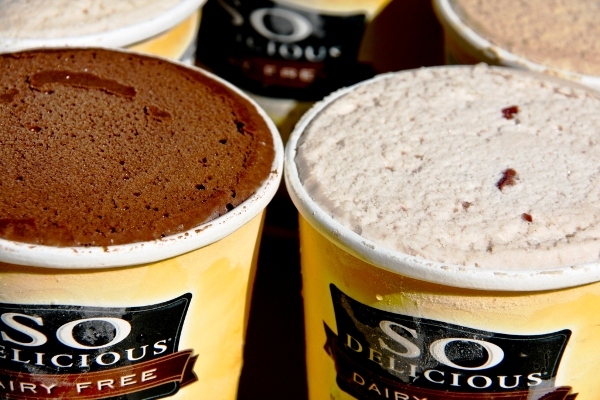 So Delicious has a few additional flavors which I did not sample, but I am sure will impress as well; Cookies N’ Cream & Mint Chip. What surprised me most about the products is that even after eating copious amounts of them (I did it all for you) I never experienced the sugar crash or craze that I usually do. What gives? 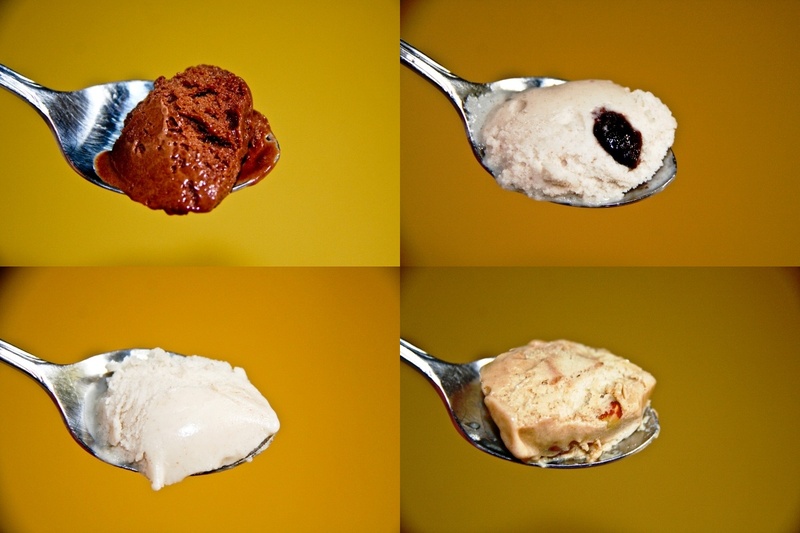 The frozen dessert pints are lower in sugar than other almond milk frozen desserts due to the use of monkfruit as a sweetener (they range from 6-10 grams of sugar per serving). I am so excited for all of you to try these new products. The Almond Plus almond milk is already rolling out to stores! 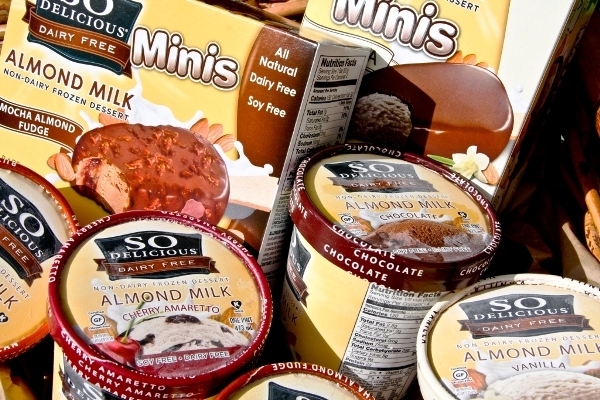 The remaining almond milk based products will be available the Spring 2012 (I believe they will begin hitting shelves in March). For nutrition information on the new almond milk based products click here. To request coupons click here. Oh…my…god… I can’t wait to try them all! Looks delicious, can’t wait for the products to hit the store. Make sure you make a mobile app for iPads. This is so exciting…I went almond and never looked back. Thanks for the sneak peek! I’m definitely keeping my eyes out for these products, I can’t wait to try them!!! Wow, I cannot wait to try these! Can I wake up to a box of ice cream on my doorstep? 😀 I love almond milk, so I’m very excited for these So Delicious products to roll out in stores–I will buy them for sure! beautiful pictures. I too received a sampling of their products and looking forward to review and share, but you seriously out did yourself with the amazing pics and praises 🙂 I guess that’s pretty easy with products from So Delicious- they are just amazing! all. the.time. Thank you so much for your kind words Stephanie. My husband read my post and said , “Was it all really that good or were you just being nice?” After explaining that it really was that good I had him sample everything and with the exception of the Cherry Amaretto ice cream which he wasn’t a fan of, he really liked the products as well. 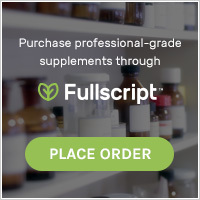 I made a decision a while ago to only post reviews on my site for products that I find to be exceptional and these products definitely fit into that category. 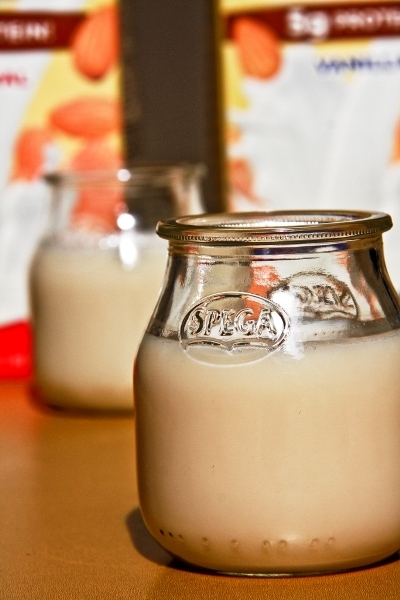 Since you were also given the opportunity to try them I’d love to hear your opinion of the almond milk products. Which were your favorites? My daughter LOVES, LOVES, LOVES this stuff. So much so that I’ve called 6 stores and visited 2 Whole Foods in search of this. Even called Turtle Mountain and posted to their Facebook site! My local Vons carried it, but not enough people purchased it and it expired. Trying to convince them to reorder it! Looking forward to a time when I can consume it everyday. You are seriously dedicated to finding it…love it! That’s how I am about the Greek yogurt!